We live in an age of social media. Literally hundreds of millions of people read and share thoughts in a myriad ocean of online communities. To a degree, that's great; information is a resource which can be multiplied and built into greater concepts, but there is a problem - too many people take statements at face value and trust outright lies. This dilutes the information's value and effectiveness, and can cause conversations to collapse into useless bickering. What's missing, I submit, is the ability for readers to critically evaluate claims and statements, to remove the dross and make sure they accept only valid assertions. Critical thinking is not simple pessimism, or a cynical attitude. You need to be able to know that your information is reliable and trustworthy. You need to know that your conclusions are more than assumptions which sound good to you. After all, your own reputation wil rise or fall on the value of information you pass along as your own claims. 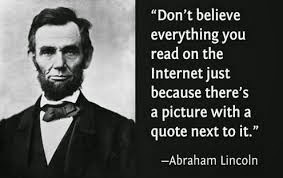 When you read something online, consider whether it is an assumption by the author, compare it to your own knowledge and experience, and test it with logic.